Elderly Baloch politician and former chief minister of Balochistan Sardar Attaullah Mengal has said the root causes of problems in Balochistan were the Inter-Services Intelligence (ISI) and security institutions, and suggested the withdrawal of army, release of missing persons and trial of those arrested on murder and kidnapping charges in courts as the solution. In an interview with Voice of Germany here on Sunday, Mental said Balochs had reached to the point of no return as they could not get their rights by remaining within the geographical frontiers of Pakistan and they had decided not to be part of the country. 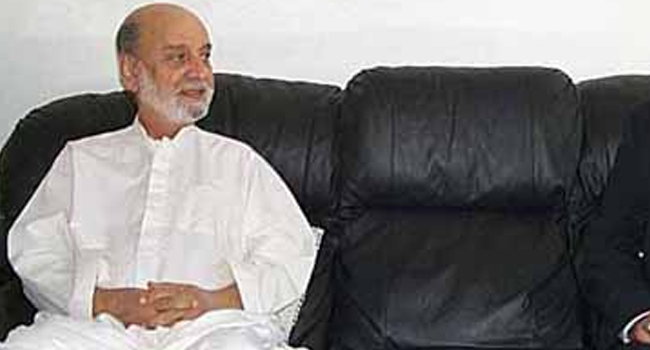 Mengal said Prime Minister Yousaf Raza Gilani and Pakistan Muslim League-Nawaz (PML-N) President Nawaz Sharif met him but no one had the power to stop the army’s intervention in Balochistan. He warned that if the army’s intervention continued, no one would be able to stop the disintegration of Pakistan. He was of the opinion that the Baloch people were receiving the same treatment as Bengalis. He said every day disfigured dead bodies of Baloch youths were being received and people were being kidnapped, which was a source of serious concern. He said he had no contacts with Baloch youths who were on the mountains and, in a message to them, said if they could fight, they should do so otherwise they should not cause difficulties for their families and return home. Mengal said Baloch youths were not under his control and had he been not aged, he would have been fighting alongside them in the mountains. there has been injustice to the people of baluchistan. They don't like to be called combative or militants . Their demands are very much fair. Army should get out of baluchistan and let the civilian govt to deal with them. Its my humble request to defenders of pakistan .Please do not repeat the history of bengal. I am a 22 year old engineering student who has no interest in politice. We people are only concerned for our careers but having see the interview by Sardar mehgal. I felt .that there is truth in his words. Pakistan army zindabad.Why army get out of balochistan. Why army get out of sind.Why army get out of khyberpakhtankhwa.Why army get out of punjab.Pakistan army is made of pakistanis(balochi,sindi,pathan,punjabis) and they will go everywhere they need either some one weep or smile.Maria u better take interest in engineering than becoming security analyst at this stage.I know better than u.Talking about waziristan or baluchistan at home is not good.Anyone commenting should visit waziristan or baluchistan to see facts.Bengal was 6000 kilometers far and no atomic bomb that time.Even superpowers failed in afghanistan,vietnam and hitler in world war and india in azad kashmir in 1948 although india 5 times bigger.The biggest problem pakistan faced in bengal was supply of food,oil for vehicles,weapons and army was surrounded by 5 times bigger india,bengali terrorists and distance was more than 5000 km and pakistan has no ships and those present were not able to pass in open sea and had to pass indian ports.Inshaallah in balochistan that history cant be repeated.Neither india can attack as he fear atom bomb nor all balochistan are balochi.50% are pathan.Similarly pak army is not interested in living deserts or mountains instead of CANTT areas but for country sake,they will not follow terrorists everywhere and will like to die by bullets than let pakistan devide. One should go to basics in order to have any solution. One thing i want to ask that Why should Pakistan army kill a Pakistani whether it be a Punjabi, Sinhi, Balochi or Pathan, the answer is that there must be some reason behind such act which Army is only doing in Balochistan. I have also not that much knowledgable in terms of Balochistan but one thing is very well known that there is still slave system and sardarism which has far behind the past in new woeld. I think that there must be any good solution to balance the situation and stabilize Baloch's. Sardarism should be discouraged who never let the ladies to school, who do not want to develop for the reason that development may cause hurdle to their Sardarism and which may put an end to their rule.